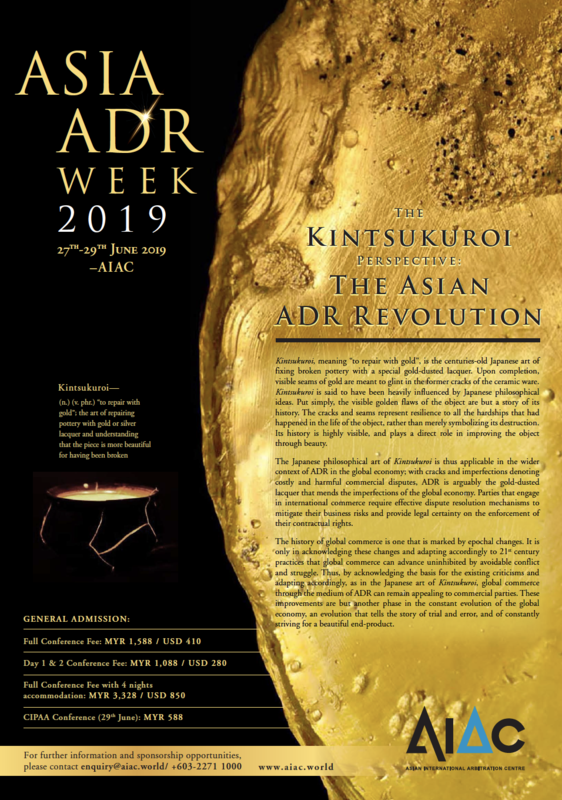 The Asian International Arbitration Centre presents its ASIA ADR WEEK 2019, "The Kintsukuroi Perspective: The Asian ADR Revolution". Kintsukuroi, meaning "to repair with gold", is the centuries-old Japanese art of fixing broken pottery with a special gold-dusted lacquer. Upon completion, visible seems of gold are meant to glint in the former cracks of the ceramic ware. Kintsukuroi is said to have been heavily influenced by Japanese philosophical ideas. Put simply, the visible golden flaws of the object are but a story of its history. The cracks and seams represent resilience to all the hardships that had happened in the life of the object, rather than merely symbolizing its destruction. Its history is highly visible, and plays a direct role in improving the object through beauty. The Japanese philosophical art of Kintsukuroi is thus applicable in the wider context of ADR in the global economy; with cracks and imperfections denoting costly and harmful commercial disputes, ADR is arguably the gold-dusted lacquer that mends the imperfections of the global economy. Parties that engage in international commerce require effective dispute resolution mechanisms to mitigate their business risks and provide legal certainty on the enforcement of their contractual rights. The history of global commerce is one that is marked by epochal changes. It is only in acknowledging these changes and adapting accordingly to 21st century practices that global commerce can advance uninhibited by avoidable conflict and struggle. Thus, by acknowledging the basis for the existing criticisms and adapting accordingly, as in the Japanese art of Kintsukuroi, global commerce through the medium of ADR can remain appealing to commercial parties. These improvements are but another phase in the constant evolution of the global economy, an evolution that tells the story of trial and error, and of constantly striving for a beautiful end-product. List of speakers and presenters to follow. For full programming, please click here. For sponsorship opportunities, please drop us an email at enquiry@aiac.world. To register your interest in the event, please drop us an email at events@aiac.world.